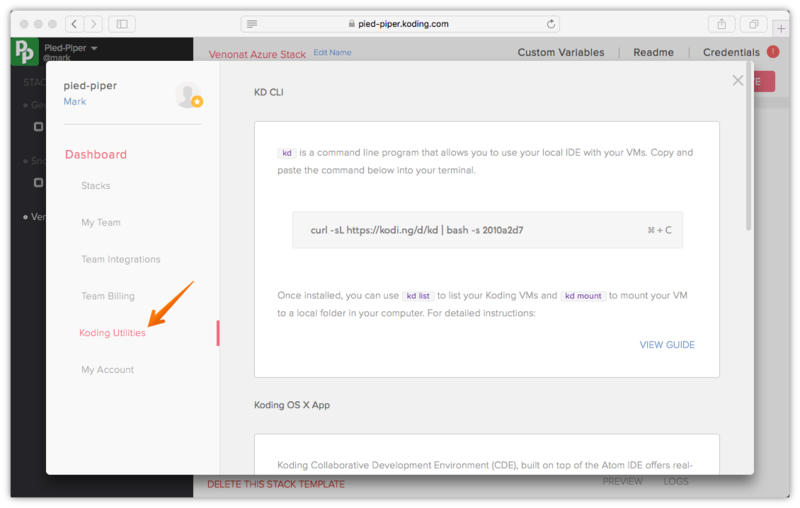 Access your remote VM files and edit them using your favorite local IDE(s). Copy the kd install command then paste it in your local machine terminal & run..
Hello, this is the Koding application (kd) installer. Successfully installed and started the KD Daemon! list, ls        List running machines for user. mount, m        Mount a remote folder to a local folder. unmount, u      Unmount previously mounted machine. remount, r      Remount previously mounted machine using same settings. ssh, s          SSH into the machine. run             Run command on remote or local machine. status          Check status of the KD Daemon. update          Update KD Daemon to latest version. restart         Restart the KD Daemon. start           Start the KD Daemon. stop            Stop the KD Daemon. uninstall       Uninstall the KD Daemon. install         Install the KD Daemon. Mount folder from remote machine to local folder. Alias is the local identifer for machine in 'kd list'. folder doesn't exit, it'll be created. By default this uses FUSE to mount remote folders. You have now mounted the cloud VM on a local folder called ‘grape’. You can mount your VM on any folder name. All changes within your mounted folder are actually happening on your cloud VM. kd run is very useful as you can use it to run commands on your remote VM. Successfully updated to latest version of kd. sudo kd uninstall will uninstall kd from your local machine.